LOS ANGELES – August 15, 2017 – The group who built the first series of Shelby American racecars based on Ford’s iconic ‘65 Mustang fastbacks, dubbed the “Original Venice Crew,” will begin production of a limited series of the famous racers in Southern California. These new specially authorized versions of the 1965 Shelby GT350Rs will feature a race-focused independent rear suspension originally designed at Ford in 1964. Only 36 of these very special cars will be built, each incorporating several experimental enhancements designed by Shelby American designer Peter Brock. These upgrades were not implemented in 1965 due to time constraints. The continuation cars are licensed by both Carroll Shelby Licensing and the Ford Motor Company. In 1964, Shelby American started with a “K Code” ‘65 Mustang 2+2 and proceeded to convert Ford Motor Company’s mild-mannered Mustang into a heart pounding, fire breathing racer that dominated road race circuits all over America. Of the 562 built in the 1965 model year, just 36 were officially designated as competition models; this was denoted by the “R” in the Shelby serial numbers. The Original Venice Crew (OVC) is comprised of former Shelby American employees (1962 to 1965) Peter Brock, Jim Marietta and Ted Sutton. They began with the same 1965 Mustang, K-Code, equipped with a 289 c.i.d. engine and Borg Warner 4-speed that was the basis for the Shelby GT350 that year. This time however, Brock finally had an opportunity to refine and integrate some of the components originally deleted. These include a redesigned front valance, refined Plexiglas rear window and Plexiglas quarter windows. The OVC Crew also incorporated a very special experimental Ford Advanced Vehicle independent rear suspension originally intended for this model. Competition testing of the first car was conducted at Willow Springs Raceway in the spring of 2015. The test team included Vince LaViolette, Shelby American’s current test driver and Rick Titus, son of Shelby Trans Am winning driver Jerry Titus. Former Shelby American driver and Le Mans winner John Morton was recruited to help develop the car’s suspension and refine its handling. While evaluating the program, OVC secured licenses from Carroll Shelby Licensing and Ford Motor Company to build the cars. This allows OVC to badge them accordingly and give each a Shelby serial number. Documentation for the cars will be submitted to the Shelby American Automobile Club Registry, as well as the official Shelby American Registry administered by Carroll Shelby International. The new company will put the car into production in the fall of 2017. Each OVC built continuation Ford Shelby GT350R will be authentic from its spartan race bred interior to the mechanicals and cosmetics. Each car will feature a competition prepared cast iron block engine supplied by the Carroll Shelby Engine Company, which will be coupled to a period correct 4-speed transmission with an authentic Shelby shifter. The car bodies will be fully reconditioned and built to 1965 “competition” specs before installation of a new Brock designed front valance, refined rear window, quarter glass installation and finished with Ford’s iconic Wimbledon White paint. Production of the cars will be in Southern California, just as Carroll Shelby and the OVC team did in 1965. Since the authentic Shelby GT350R cars begin with a 1965 donor, they can be raced as well as registered for street duty. The first car will be displayed at several Monterey, California, locations during Collector Car Week in mid-August. These include the Carmel by the Sea Concours, McCall’s Motorworks Revival, Rolex Monterey Motorsports Reunion and Concorso Italiano. Several of the OVC team will accompany the cars to reminisce and talk about this new Shelby. Those interested in a Shelby from OVC can call (424) 346-3664. Additional information is available at www.ovcmustangs.com. 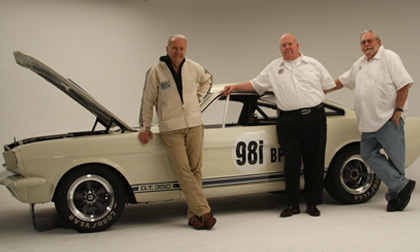 Founded by Jim Marietta, the Original Venice Crew (OVC) is the only company authorized by both Carroll Shelby Licensing and Ford Motor Company to build continuation Ford Shelby GT350R Competition Models with the optional independent rear suspension and SFM series serial number. Founded and operated by three of the people who built the first Shelby GT350R (5R002) over 50 years ago, the company will manufacture just 36 of these new “competition model” 1965 cars in Southern California. Each car has production versions of experimental parts designed by Peter Brock but not integrated into cars during the 1960s. Documentation of the cars will be submitted to the Shelby American Automobile Club Registry and Shelby American Registry administered by Carroll Shelby International. Additional information is at www.ovcmustangs.com.